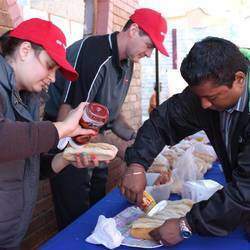 Mama Dorah Mazibuko started Siyabonga Dorah’s Ark after seeing the homeless people eating food from dustbins near Shoprite in Roodepoort CBD. She then decided to feed these people at the parking Lot in the CBD, the Government saw her compassion and donated the Old Library Building to Start a Soup Kitchen. The Soup Kitchen now feeds well over 250 people daily which includes a school lunchbox project where she prepares food for the orphans for school. Dorah has since started a skills development centre at the Old Library Building. The Skills Development Centre provides skills to the needy, these skills include; Bead work, Sewing, Soya Production, Gardening Project (Food Security System), Computer Training and Basic Life Skills. The ideas that she has are mainly focused on providing people with skills that can develop self reliant people. (Most of these projects are not running because of the lack in funding. 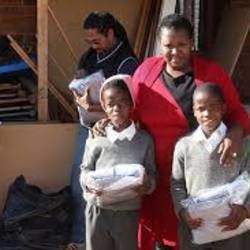 Siyabonga Dorah’s Ark has since operated for the past 10 Years and it has brought about dramatic change in peoples Lives, and all this change has been spearheaded by Mama Dorah Mazibuko. Dorah’s Ark Children’s Home is dedicated to all those children ever labeled as "orphans" with the added hope that they will never be forgotten. These children are victims of HIV/AIDS, live in Child Headed Families, and are vulnerable children with no source of income which exposes them to victimisation. For those we have encountered (both directly and indirectly) that would sooner forget that they are orphans due to their socio economic problems, there have been many others whom we have helped to establish themselves and finish school. 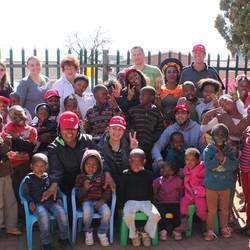 - Building the Orphanage Home or Wendy Houses suitable for residing in.